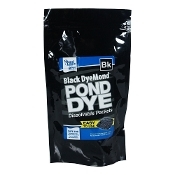 The power of Pond Logic Pond Dye is now available in a convenient water soluble packet. 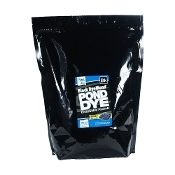 Our concentrated formula allows 2 packets of Pond Logic Pond Dye to treat like a gallon of competitive liquid dye. Pond Logic Pond Dye Packets are available in 2 colors, each with its own unique application. While we provide color recommendations below, each shade of Pond Logic Pond Dye provides the same reliable protection and can be selected based on your personal color preference. • Nature’s Blue is the ideal color for decorative ponds as it contrasts perfectly with lush green landscaping. • Black DyeMond creates a mirrored surface which beautifully reflects surrounding trees and natural rocky landscapes making it perfect for natural ponds in wooded areas. 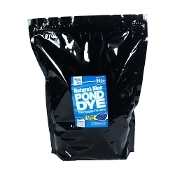 Two packets treat the same as a quart of our powerful 4x concentrated Pond Dye, or a gallon of competitive pond dyes, making it extremely cost effective; saving you both money and shelf space. Convenient, water soluble packets make treating your pond a breeze. There’s no need to cut, tear, scoop or pour Pond Logic Pond Dye Packets, just throw the packets in your pond and let your water do the rest. Pond Logic Pond Dye is a completely natural product. 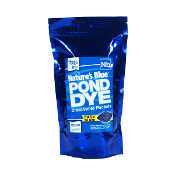 When used in accordance with label directions pond dye is completely safe for your fish, plants, pets and pond wildlife.